This is one of the fun random paintings I have come up with over the years. I had a sponge soaked in water on my portable pallet keeping my paints wet while in between actually painting. As I was heading to or from one of the several outdoor painting locations I had been to with my mom, the sponge had rolled around in the wet paint. The sponge had several different colors on it and I carefully dabbed it on the canvas. I then filled in with different colors and even added some more dots in several locations to help fill in what looked like a tropical location. I was at a 1 day women’s retreat at my parents’ church with my mom. The theme for the retreat was Uniquely You. There was a lady painting on a canvas she had painted black. I was sitting there thinking that it would be fun to paint on the black canvas that I had but did not know what to paint. Within 5 minutes I had come up with this painting and quickly sketched it out with a pen on back side of the notes we had received for the day. It was another time in my life where God answered a longing in my heart. I will freely admit that I am perfectly imperfect or consistently inconsistent. That would be true of any human on this earth currently. We are all imperfect and all inconsistent in our own ways. Some people may be more noticeably imperfect or inconsistent. There are times I may even be one of those noticeable people. It is OK to be imperfect and inconsistent. The point is not to be either of those well. We are called to be Christ like. As we grow in our relationship with Jesus, we become a little more perfect and a little more consistent each day. We will not fully understand perfection and consistency until we are called home to be with Jesus. So why do I write about my imperfection and inconsistency? Easy, people need to know that they are not the only ones out there who are imperfect and inconsistent. On Sunday mornings and Wednesday nights or any other time we are at church, we tend to put on an everything is just fine face when inside we are falling apart and not even sure if we will be able to get out of bed the next morning. I have my struggles in life. The devil knows where to hit me below the belt and the perfect time to do it. If I give into that temptation, then I am not being Christ like at that moment. I am showing my imperfect, inconsistent side even if no one except me see it as God will always see it. He will gently correct and remind with such a large dose of love that we may not realize what is happening to try to get us on the correct path. God does not pressure us to follow Him. He does not beg nor plead. He invites us and lets us decide. He reminds us of that invitation periodically, keeping the door of communication open if we ever want to talk, but He never pesters us with that invitation. As I fight the devil, I need to remember that Jesus is right there with me in the fight. He as already won the battle and I need to let Him be in control as I am not the right leader for my life. How should I be ingraining that truth in my life? I need to remember to read the Bible daily and pray. Both help immensely with the reminder as I immerse myself in them. By immersing myself in the practice of Bible reading and prayer, I immerse myself with God. He uses the Bible and prayer time to commune with us so that we can get to know Him. As we get to know Him, we learn about Him and how consistent and perfect He is. We begin to realize that He can be trusted and that He has our best in mind as He cares for us. Some day I will learn this. Some day I may even be consistent with the Bible reading and prayer. Until that time, I will do my best and be very thankful for a loving, gracious, merciful, and very patient God. At the beginning of the week that I was trying to figure out the Come Alive painting, I was attempting my quiet time when I opened my journal. It happened to open to the first page where I had an index card written from a friend. I had forgotten about that index card until I read the words on there “Don’t forget, I LOVE YOU! -God”. I ended up in tears as I had been going through some massive spiritual warfare over the previous week or so. Shortly after that, I came up with a painting for those words. I wanted to do the background in a similar style to another painting of mine without using the same colors. What you see is what I came up with. 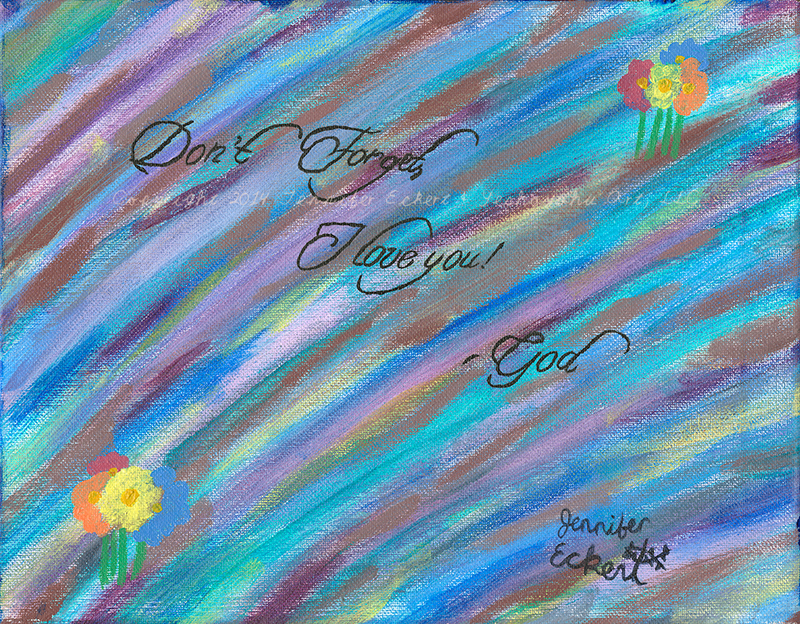 As I was waiting to start that painting (needed to finish Come Alive first) I felt that I was supposed to give a photo of the finished painting to Jeremy Camp when I saw him about 2 months later. I had no idea why, then he mentioned something somewhere that confirmed why I was supposed to do that (and I couldn’t tell you what it was). The flowers in the painting are meant to be more subtle and blend in to a degree. I was trying to come up with something that expressed romance in a way that humans tend to portray it without going overboard in the romance side of things, hence the fancy font and the flowers. This is the first of many posts that will give the story behind my various paintings. Enjoy. I was driving down a county road out in the country while being minutes away from suburban city life trying to unwind from a day of work on my commute home. As I was driving down the road I was listening to the song Healing Hand of God by Jeremy Camp. While the song was playing this painting idea popped into my head. I had 30 minutes before I could write it down and took about 2 months to plan out and draw before I started painting it. I have put my testimony online before and as with any testimony of your life, it should be changing until the day God calls you home. My testimony is no different. I was exposed to junk growing up. It was not just the problem of the person initially responsible for the junk. In its own way, it became my problem as well. Over 20 years after that exposure ended, it is still a problem at times and the other person cannot be at fault for that as that person cannot control how my brain works. The devil tries to get in my mind saying that giving into the junk will be OK. It is spiritual warfare at the most basic of understanding. Certain areas of my life I try to guard heavily to prevent the junk from creeping in and taking over. There are certain things I avoid and certain things I do in that process. We are called to guard our hearts for the heart is the wellspring of life (Proverbs 4:23). For me, I need to guard my mind as well. The Jews used heart and mind somewhat interchangeably which makes sense as a person cannot live if either one of the 2 organs fail to function let alone both of them. The last several weeks have been ones of struggle. The junk has been trying to creep in several times. When that junk creeps in, a depression tries to join it. I know letting the junk in is letting sin into my life thus creating a separation from God that does not need to be there. When I do that, I tend to get depressed until I attempt to get things turned over to God. The depression is mild and I know what causes it. Back in January I received a song entitled “I Will Follow (You Are With Me)” as part of my pre-order for Jeremy Camp’s new album I Will Follow* (yes it is the title track). The first time I heard that song, I knew it had some power to it. It also came at the time that temptation was trying to sneak in and rear its ugly head. The song was not listened to as often as it should have been. But when I did listen to it, the temptation was kept at bay for those few minutes. I got through the temptation with many prayers from dear friends over a 2 week period. The spiritual warfare subsided back to its “normal” level of trying to creep in and I say that I won’t go there. Jeremy’s album came out February 3 and that song still had its strong impact. I can tell that the devil is trying to get that junk snuck back into my life and I am fighting to keep it out. My son would rather hear a different song from the album on repeat, but there are times that I tell him otherwise in the most basic of terms as he does not need to know, yet, what happened. As I write this entry, I have that song on repeat. 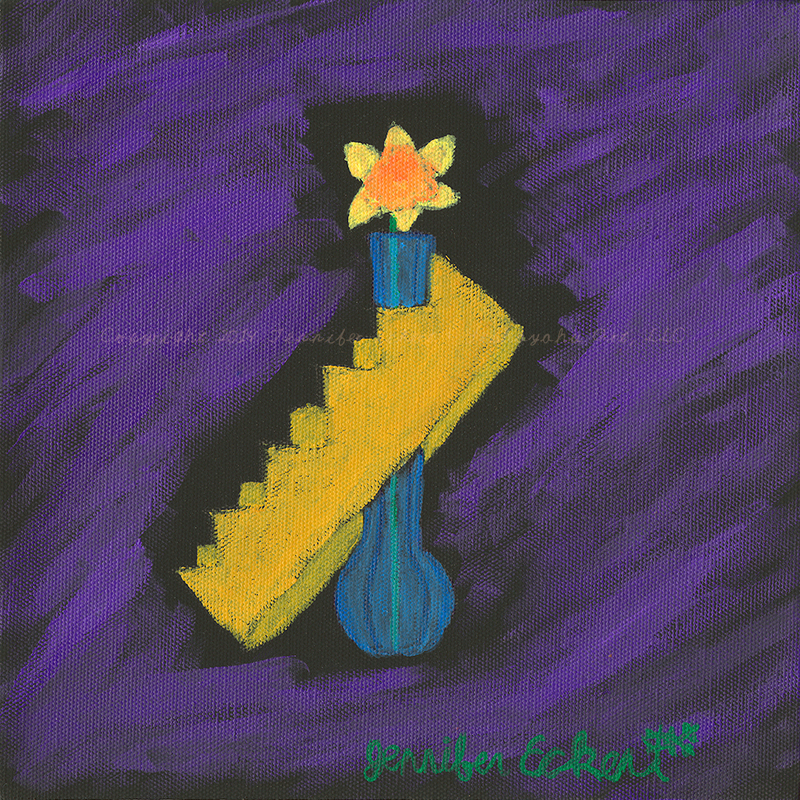 Since February 3, the album track of this song has had over 200 listens on my iTunes. Since I originally received this song in January, the 2 tracks have over 600 listens. It is keeping the devil at bay because he does not belong in my life. God belongs in my life. Sometimes what comes across as legalism to one person is how another person has to live, at least for a while, to keep from going off the deep end into serious temptation and sin. There are certain sites that although not bad, I have to avoid at least in part, if not completely, to keep the temptation at bay as some of the user content is not healthy for me while someone else may not have issues with the same piece of content. So what about the song does it? I am not completely sure, but I do know that the first verse speaks so much truth about the devil trying to get in to our minds with stuff that is not of God while reminding us that God is there through it all, in spite of it all. The song forces the Truth in while forcing the lies out. Even if my mind wanders to where it shouldn’t, I find that the wandering is not lasting as long as it could have otherwise. I press on in this fight because I am a child of God and the devil can’t take that away. I will do my best to follow God wherever He goes. *The album review can be found here. The last 2.5 months have seen me going through some personal struggles and some self-realization about those struggles. The battle has mostly been silent and internal. The battle shows up in how I feel and how I look (at least with my facial expressions). It affects what I get done day-to-day. Through this latest struggle, I have come to be reminded of God’s unending, unrelenting love for me and that He knows all of the struggles that I have gone through my entire life. I want more of God yet struggle to actually live that way. 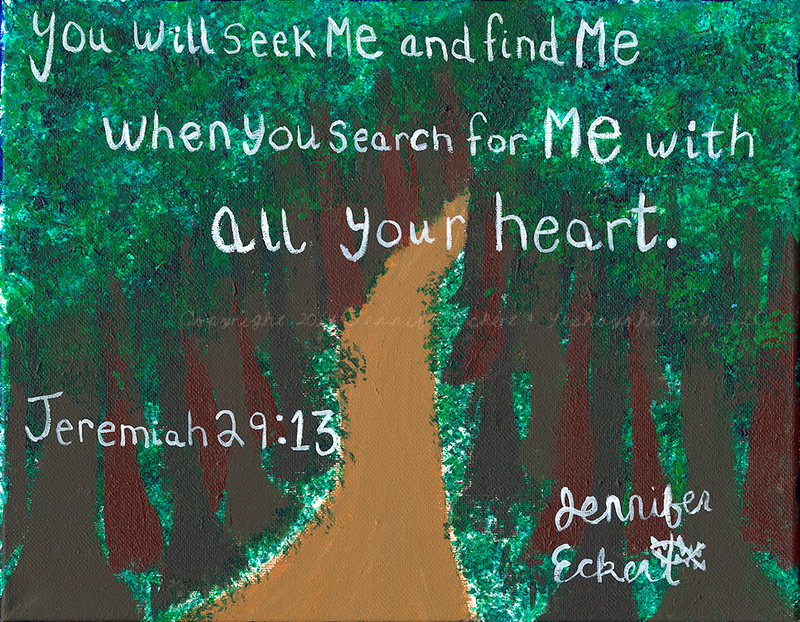 Since August when I found the index card, I have had Jeremiah 29:13 in my head. Today as I was listening to the introductory sermon on experiencing God, the pastor mentioned Jeremiah 29:11-13. That was not a coincidence. I continue to struggle and am fighting the spiritual warfare of this week and especially today. I am determined to not have the depression kick in that happens during these struggles. There is always hope with Jesus and I know I can trust Him despite my struggles to the contrary. I know I am loved by a God who will never give up and always provides everything I need plus the occasional want. I will continue to pray and remember that “He knows every hurt & every sting”* because He has been there. Most of my artwork is somehow inspired by music. It usually takes several listens to a song before a painting idea comes to mind. I expect that to happen as the lyrics need some time to sink into my brain and be processed. I am a thinker and can spend hours processing my experiences and emotions trying to figure out what I am feeling at the moment or about a recent experience. When I listen to music, it is not uncommon to see me conducting along or playing an air instrument that fits with the song. Music moves me in ways that nothing else can. The closest is being out in nature while on my bike and that still pales in comparison. Music captures my emotions and yet can open a door and release them when nothing else would. 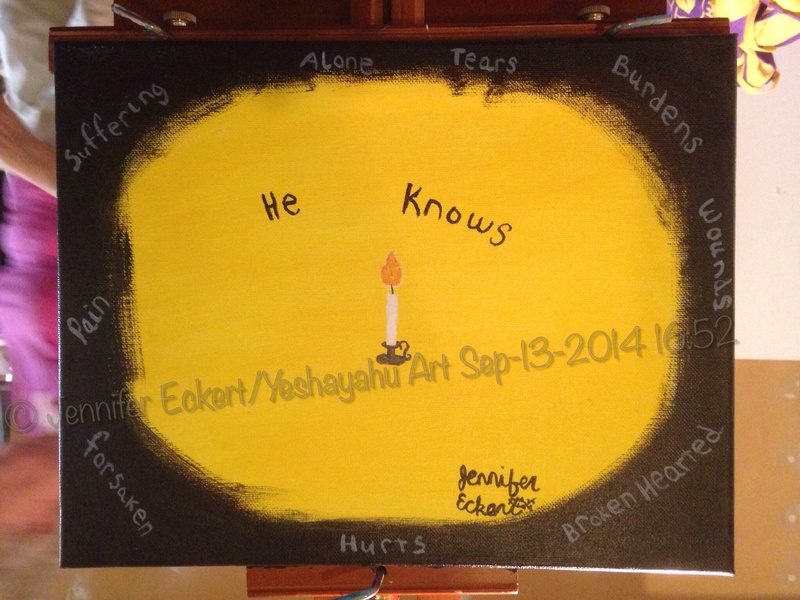 On September 12 I heard Jeremy Camp’s newest single “He Knows” for the first time. I quickly suppressed my inner fangirl to pay attention to the lyrics. About 20 minutes before I went to bed that night, an idea for a painting for that song popped into my head. I quickly looked up the lyrics to make sure what I was thinking would work and the next day I began work on the painting nearly completing it in about 3 hours. 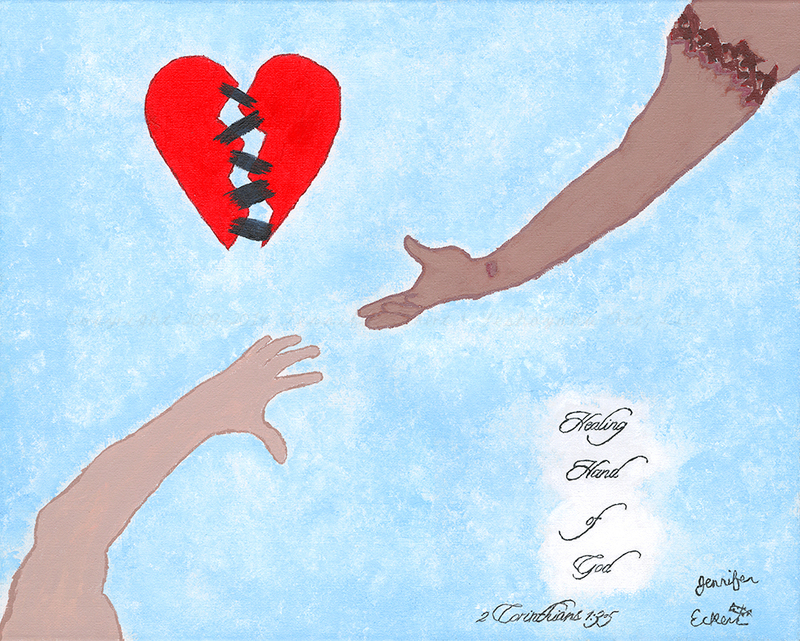 As the painting progressed, I had the lyrics up on my phone so that I would grab the right words for around the outside to show what God knows about what we go through. At this point I had only heard the song once. I have had the chance to hear it a total of 3 times so far with the second and third time happening Monday and Tuesday. This third time, I found myself starting to conduct the song when the lyrics hit me like a ton of bricks. Healing tears came a flowing for several minutes after. This is not the first time that music has inspired art work nor the first time that a song, which has a corresponding painting, has brought me to tears. The tears are always healing and so worth any runny nose or impending headache that may come with them. I am thankful when those tears flow as it means God is doing something in me that will draw me closer to Him. I want to be closer to Him, yet I struggle with my walk. So much music expresses my struggles and reminds me of God’s promises that He is there faithfully. He is willing to help us in our unbelief and our failures while cheering us on when we get something right or make a step in the right direction. I look forward to more new music coming out by Jeremy Camp (the new album drops sometime in early 2015) and other musicians. I also look forward to seeing what music God uses to inspire new paintings and driving the passion to draw others to Him through those paintings.